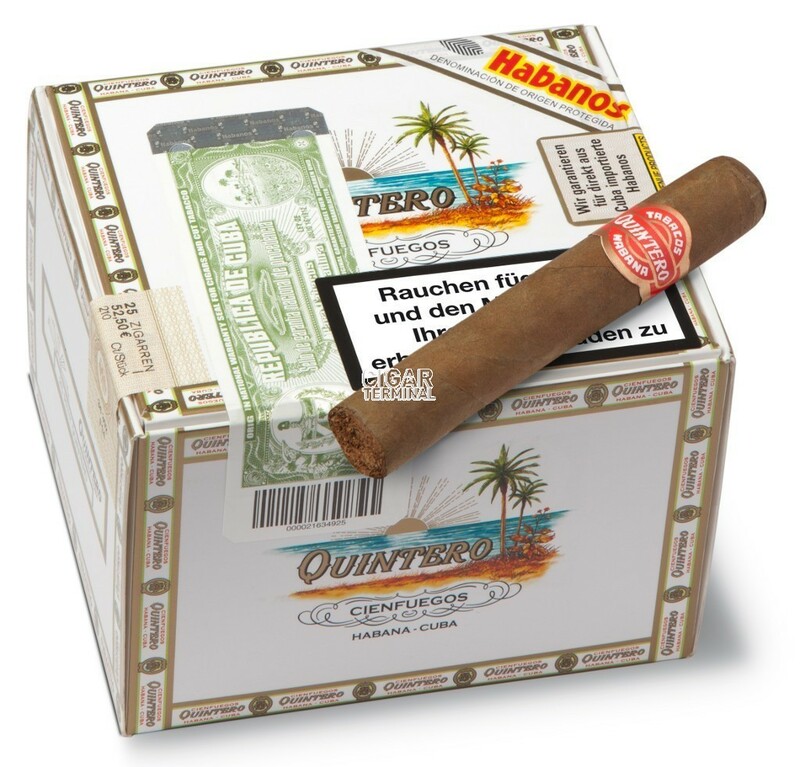 The Quintero y Hermano Petit Quinteros is a great medium bodied Petit Corona, of 43 ring gauge, 4.1” (105mm) long and comes in a box of 25 cigars. Because of its solid and consistent construction and its affordable price, this is one these cigars that is able to become your everyday cigar. It is perfect for a morning break or a quick afternoon smoke. The Quintero Petit Quintero is a very good option for short morning cigar. •	Medium bodied cigar offering some delicious flavors of tobacco, nuts, coffee and hay with some wood notes. •	Being still a rather young cigar (released in 2014), it deserves to be aged couple of years. Quintero simply delivers a great Cuban experience at a lesser cost. The Petit Quintero has a rustic look but it is looking great nevertheless. The wrapper has a beautiful uniform Colorado shade (medium brown with a reddish tone) and the quality of it in general is great despite visible veins. It feels very smooth and slightly oily. The cigar is well packed from the foot until the cap. The cap cuts perfectly and the cold draw is great, and gives a nice and sweet tobacco aroma. The cigar gets lit easily and generates ample billows of smoke. The first draw brings some flavors of light hay, sweet tobacco and nuts with some red fruit notes. The burn line is great right from the start, and is not an issue throughout. A great construction on this small cigar. The first third of the cigar is pretty enjoyable; the Petit Quintero is medium in strength and develops a nice and classic Cuban tobacco flavor, with some hints of hay, coffee and leather. There are also some notes of wood. It is rather sweet and smooth overall. In the middle third, darker coffee notes are noticeable; otherwise the flavors remain similar, while the body of the cigar is still at a medium body. In the final third, the flavors are getting a bit more intense, the cigar shows a bit of it youth.